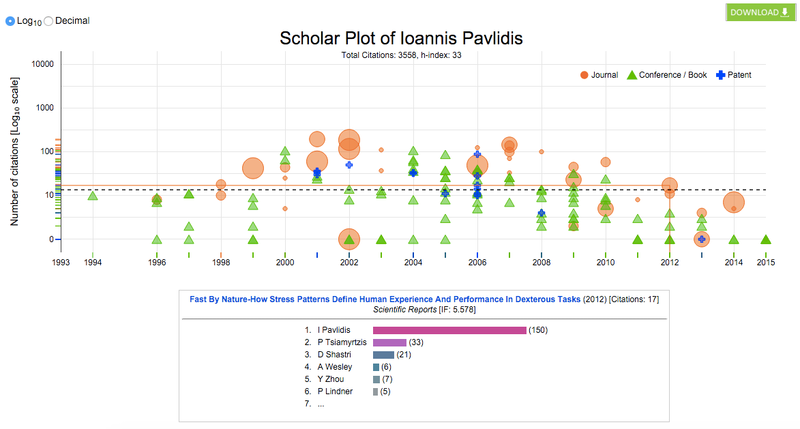 Scholar Plot provides a compact visualization of a scholar's academic career. From a single page, one can quickly assess the quality and quantity of the scholar's publications and the amount of funding they have been awarded. To visualize the accomplisments of a scholar, type the name of a scholar in the search box. As you type, Scholar Plot will attempt to match your query to the names of scholars in our system. If the result of a search produces no results, Scholar Plot will prompt you to enter the URL of the person's Google Scholar Citations Profile. 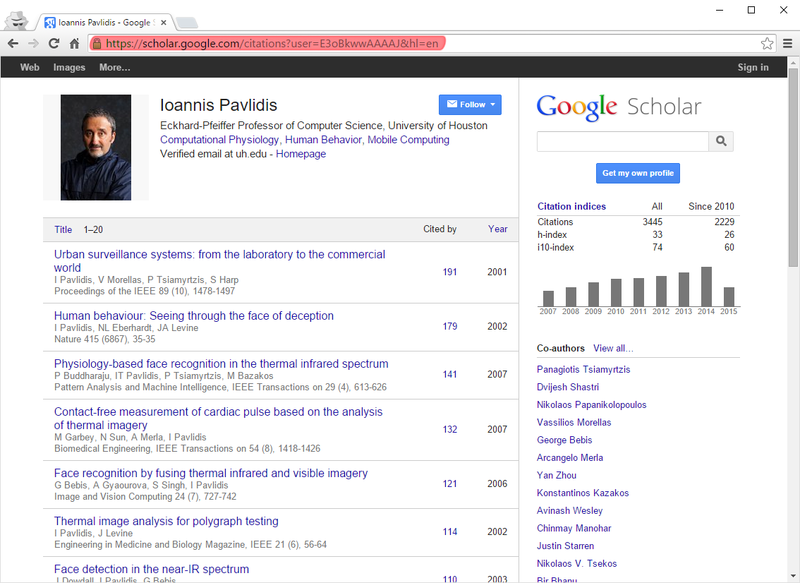 Instructions for finding a Google Scholar URL can be found (here). When a name cannot be found in our system, Scholar Plot will prompt the user to enter the URL of the person's Google Scholar Citations Profile. This URL can be found using the search bar on the Google Scholar website (here). 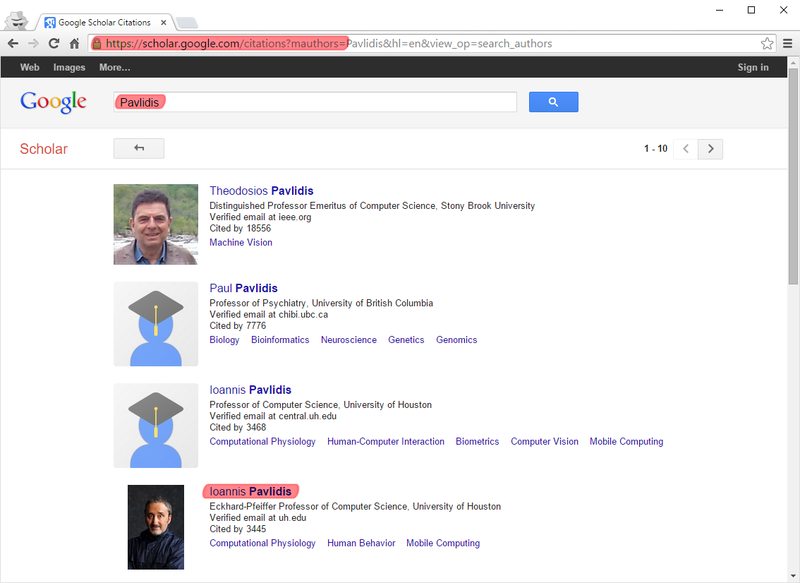 If the names of more than one scholar match the query, you will need to locate the correct scholar in the search results (example below). From the person's Google Scholar Citations Profile page, copy the URL from your web browser's address bar (example below). Return to Scholar Plot and click the "Submit" button. The scholar's information will then appear and their name can be used in future searches on Scholar Plot and Scholar Compare. The first plot depicts the publication profile of the scholar in question. The publications are laid out in a 2D diagram (number of citations vs. year of publication) with the h-index marked with a dotted line; the citation scale can be either logarithmic or decimal. The journal papers are represented as disks with areas analogous to the impact factor of the respective journals. The patents are represented as crosses and the books/conference papers as triangles. By clicking at a symbol you can obtain the publication’s title, the number of citations, the venue name and its impact factor (if it is a journal), as well as a breakdown in the authorship, complete with the level of collaboration between the co-authors and the said scholar. You can bring the journals, patents, and conferences/books in and out of the view by clicking at the respective legend. Time-series representations for the three P&T factors i.e., citations, impact factor and funding. Specifically, total funding per year is given as a bar graph; total citations per year are given as a polyline; mean IF per year commensurates with the size of disks that connect the polyline segments. The normalized plot depicts the deviation from the mean of all faculty in the particular discipline in a particular year. Scholar Compare visualizes the comparison between two different scholars. The overview displays the h-index, total citations, home run citations, mean impact factor and home run impact factor for the two scholars in the form of multiple bar graphs. Each color represents one of the scholars, indicated by the key at the top of the section. The Citations Distributions chart shows the spread of the citations of all publications for each scholar. The n value above each box plot represents the sample size used. The stars below the title of each section signify the statistical significance. The Impact Factor Distributions chart displays the spread of impact factors of journals where each scholar published through box plots. The n value above each box plot represents the sample size used. The stars below the title of each section signify the statistical significance. The h-index distributions chart displays the spread of the funding grants for each scholar through box plots. The n value above each box plot represents the sample size used. The stars below the title of each section signify the statistical significance. The Department Plot visualizes the data of scholars within a single department. Alternatively, clicking on the name of a college displays its College Plot visualizing the data for the entire college. The Academic Garden visualizes the vitality of a department. Each tenure or tenure-track faculty member is represented by a flower. The three P&T factors are summarized in terms of quartiles. 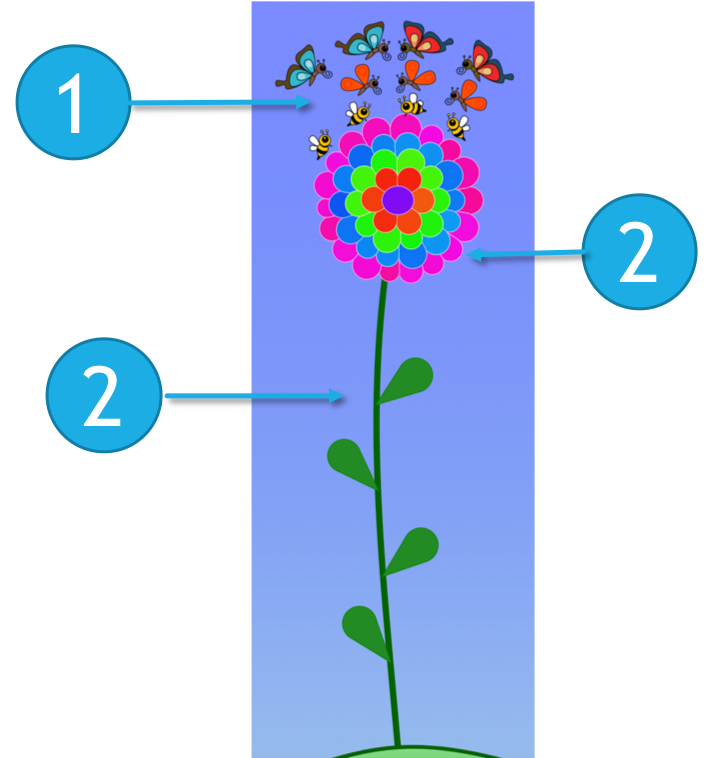 Impact = Citations: Layers of pollinators. Prestige = Impact Factor [IF]: Rounds of petals. Resources = Funding: Number of leaves. In the local scale, these quartiles are computed based on the faculty within the same department. In the global scale, they are computed with respect to all other faculty in the same discipline using CIP Codes. The normalized plot depicts the deviation of the departmental mean of the 3 P&T factors with other departments in the particular discipline in a particular year. The h-index is a form of measure that takes into account the number of citations and number of total publications made by a scholar. The Home Run Citations bar chart shows the highest cited paper within the department, with the largest number of citations of a publication on the y-axis, and the scholar associated with that publication on the x-axis. The Citations bar chart displays the total amount of citations a scholar has received through all of his/her publications. The Citations Pie Chart displays the percentage of citations that each scholar produced out of all the citations in the department. The Home Run Impact Factor bar chart shows the highest journal impact factor for each of the deparment's scholars. The impact factor is on the y-axis and the name of the scholar is on the x-axis. The Mean Impact Factor bar chart shows the average level of journal impact factor by each scholar in the department with the impact factor on the y-axis and the name of the scholar on the x-axis. The Impact Factor Pie Chart displays the percentage of journal impact that each scholar is responsible for out of the total journal impact of the college. The funding bar chart shows the amount of funding awarded to each scholars in the department with the amount of dollars in funding on the y-axis and the scholar associated with that funding on the x-axis. The Funding Pie Chart displays the percentage of funding that each scholar has received in the department. College Plot visualizes the data of scholars within a college. Alternatively, clicking on the name of a department within a college will open its Department Plot. The Mean Departmental h-index bar chart shows the average h-index for each department in the selected college. The y-axis is the mean h-index and the x-axis is the department name. The Home Run Citations bar chart shows the number of citations of thead highest cited paper within each department with the number of citations on the y-axis and the names of the departments on the x-axis. The Mean Departmental Citations bar chart shows the average number of citations for the scholars in each department with the number of citations on the y-axis and the names of the departments on the x-axis. The Citations Pie Chart displays the percentage of citations that each department produced out of all the citations in the college. The Home Run Impact Factor bar chart shows the highest journal impact factor of each department with the impact factor on the y-axis and the names of the departments on the x-axis. The Mean Department Impact Factor bar chart shows the average level of journal impact factor by each department with the impact factor on the y-axis and the department on the x-axis. The Impact Factor Pie Chart displays the percentage of journal impact that each department is responsible for out of the total journal impact of the college. The Funding Pie Chart displays the percentage of funding that each department has received in the college. Department Compare displays the datasets of any two departments from any university in the system. If your department is not represented, you can add it using the Data Request Form (here). The overview displays the mean-h index, mean citations, home run citations, mean impact factors and home run impact factors for the two departments in the form of multiple bar graphs. Each color represents one of the departments, indicated by the key at the top of the section. The h-index distributions chart displays the spread of the h-indexes within a department through box plots. The n value above each box plot represents the sample size used. The stars below the title of each section signify the statistical significance. The Citations Distributions chart shows the spread of the citations within the department for each university. The n value above each box plot represents the sample size used. The stars below the title of each section signify the statistical significance. The Impact Factor Distributions chart displays the spread of citations within a department through box plots. The n value above each box plot represents the sample size used. The stars below the title of each section signify the statistical significance. The Funding Distributions chart displays the spread of mean funding of each faculty within a department through box plots. The n value above each box plot represents the sample size used. The stars below the title of each section signify the statistical significance.